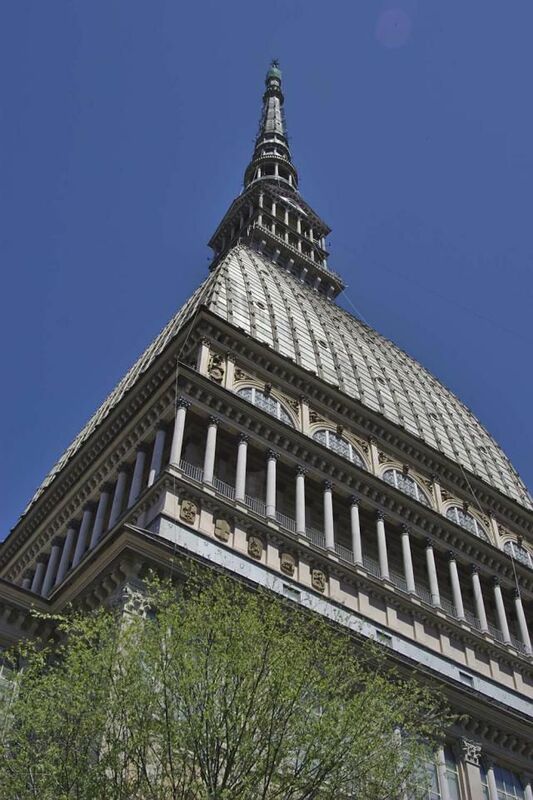 Until recently, the Mole Antonelliana, which houses Italy's National Cinema Museum and is shown above, was the highest masonry structure in Europe at over 500 feet. The tower, designed in 1863 by Alessandro Antonelli, is a familiar landmark in Turin; its image is stamped on the Italian 2 Eurocent piece. Inside there are five floors of movie memorabilia, continuously playing movies you can view from specially designed lounge chairs with sound built into the headrests, a restaurant and more. The museum was renewed and exhibits expanded in 2013. Here's a light-hearted exhibit on the magic of film and the technology used over the years to produce cinematic wonders. Behind it is the film playing in the central exhibition space. The exhibition floors wind around the outside of the Mole Antonelliana; the inside is a soaring empty space, in the center of which is a "naked" elevator which can take you up to the observation deck, the views from which are spectacular, as you will see next. Here's the view as you get off the elevator. Head through that pass and you'll be in the center of the 2006 Winter Olympics ski venues. Turin stretches a long way toward those alps. Turin was the first capital of Italy for four years starting in 1861 when Victor Emmanuel II of Savoy was proclaimed the first King of Italy. Turin is currently Italy's fourth largest city. Get in a cab, travel down that big, wide road down there and go to Rivoli castle, where you'll find Combal.Zero, one of Italy's most celebrated and creative restaurants. Superga, designed by Filippo Juvarra was built in a panoramic position itself--and features some of the best views of Turin and the surrounding area you'll find--many folks say the best views in all of Europe oringinate at the Superga. The royal tombs of the House of Savoy are here. The first stone of the Superga was laid by Duke Vittorio Amedeo II in 1717. And that concludes our tour of the National Cinema Museum in Turin, Italy. If you'd like more information and can listen to audio on your computer, you can listen to our mp3 file Podcast on the National Cinema Museum. Can You See the Shroud of Turin in Italy?